Samuel Pearce was born in Truro, Cornwall, UK, in 1807. The Dictionary of North Carolina Biography(1) reports that he came to the U.S. (Virginia) at an early age and was eventually ordained as a Methodist minister. He gave up the life of a circuit-rider when he settled in Hillsborough in 1848, though he continued his calling as a minister. Pearce also briefly operated a school and was an agent for northern book publishers. In 1852, Pearce, Calvin Wiley, and William Cooke began collaboration for the publication of a new map of the State to be accompained by a gazetteer. We’ll save most of the details of that project for another day. Suffice it to say that Wiley dropped out very early to pursue other interests and Cooke and Pearce apparently had different visions for their enterprise. Cooke announced the dissolution of his partnership with Pearce almost simultaneously with his announcement that the map had been sent to the publisher to be engraved. Pearce didn’t let this minor setback dissuade him. Unable to copy Cooke’s map, he resorted to the still breathing MacRae-Brazier plates. 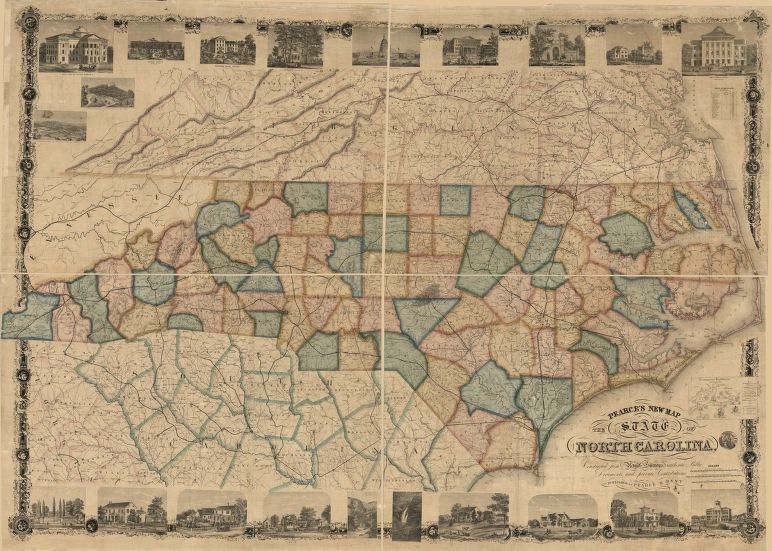 Samuel Pearce’s wall map of North Carolina, embellished with more than 20 beautiful vignettes was published in 1859. On Pearce’s map, many of the New York vignettes included on the publisher’s mock up map have been replaced by vignettes of buildings in North Carolina and the District of Columbia, and several North Carolina natural landmarks, such as Pilot Mountain. However, there are still a number of unlabeled vignettes at the bottom of the map that represent buildings in New York. For example, one building has “Dr. J. Trissler” above the portico. The home and office of Dr. John Trissler was in Vienna (Phelps), Ontario County, NY. To zoom in up close on these vignettes, try here (more user friendly) or here (more reliable). These advertisements do not refer to the accuracy of the map, and with good reason. The 1857 Cooke map was unquestionably a more accurate map, being an entirely new map rather than a recycled and minimally updated 1833 map. Perhaps this was a factor in the legislature’s rejection of Pearce’s request that the State purchase copies of his map for the common schools. 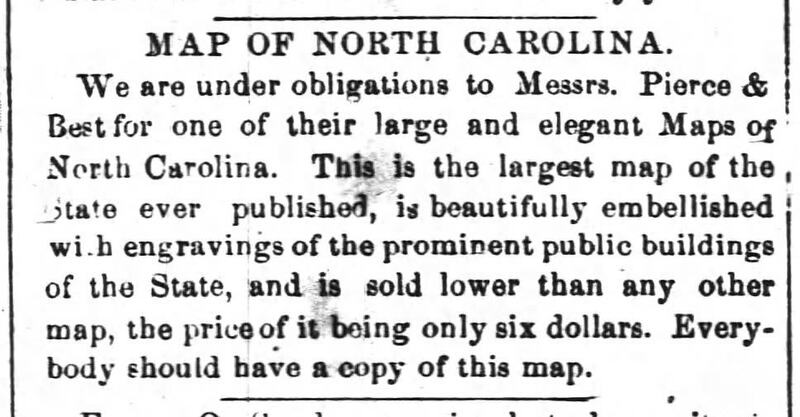 With only two known surviving copies of Pearce’s 1859 map (Library of Congress and State Archives), one can safely assume that very few readers took the Raleigh Register’s editors’ advice. Comments or questions are greatly appreciated. Tell us “What’s on your mind” below. (1) see http://ncpedia.org/biography/pearce-samuel for biographical information on Samuel Pearce; however, the information it provides on Pearce’s maps is not reliable. This entry was posted in 19th Century, Decorative Elements, Map Advertisements and tagged north carolina maps, Samuel Pearce, william d. cooke by crmaps. Bookmark the permalink. Nice work and interesting as all get out.